Matching the right offer to the right customer at the right time is a complex challenge, especially across multiple channels. 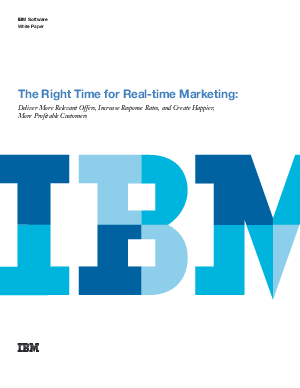 But in a climate of rising customer expectations, now is the right time to go real-time. Download this white paper to learn how forward-thinking organisations are deploying real-time marketing strategies to generate offers based on deep customer profiles, transaction histories, and other rich, real-time context. How to deliver marketing so relevant it feels like a personalised service.